If you go back early in Earth’s geologic time, there wasn’t any free oxygen. There was a tremendous amount of carbon dioxide that filled the atmosphere. Eventually, stromatolites and other single-celled bacteria produced oxygen as a byproduct. Oxygen filled the oceans and atmosphere and it mixed with iron. Remember that iron rusts when it reacts with oxygen giving it a red tint. So over time, the seafloor collected rusted iron. This rusted iron are in the different layers of banded iron formation (BIF) created about 3.7 billion years ago. The alternating layers in banded iron formations represent rock being oxidized. This is when early photosynthetic life was just trying to get started by releasing free oxygen into Earth’s early atmosphere. 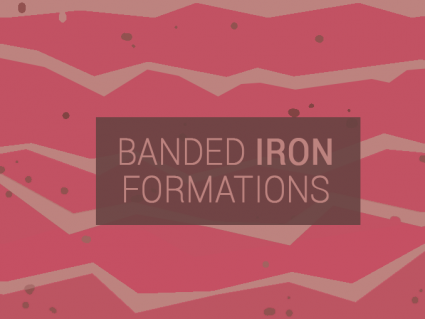 Banded iron formations account for more than 60% of global iron reserves. We can find banded iron formation all over the world such as Australia, Canada and South Africa. For example, South Africa’s largest iron mines at Sishen and Thabazimbi both extract BIF. Hematite-rich ore can be mined which are found in banded iron formations. Most of the world’s iron ore deposits were produced in the Archean Eon. What causes Banded Iron Formations? Banded iron formations typically have alternating layers. The first layer is either magnetite (Fe3O4) or hematite (Fe2O3) a few millimeters to a few centimeters in thickness. The next layer usually is iron-poor shales often red in color. 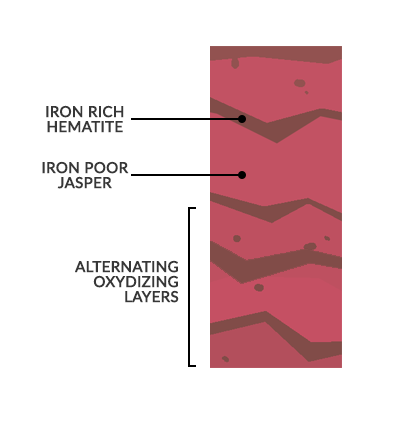 These two layers alternate with similar thicknesses from oxidation of iron and subsequent deposition. Almost all BIFs formed in the Precambrian because of the accumulation of free oxygen. Basically prior or the evolution of photosynthetic bacteria there were a lot of free iron ions dissolved in the ocean. 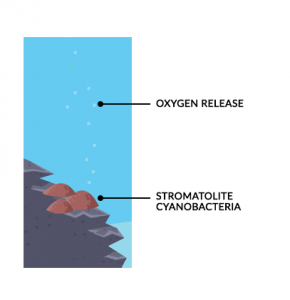 In a shallow marine setting, stromatolites and other single-celled bacteria produced oxygen as a byproduct of photosynthesis. Oxygen filled the oceans (and atmosphere) to form rusted iron in the oceans. Because there was no more iron to rust in the oceans, oxygen entered the atmosphere. This event is the Great Oxygenation Event when the atmosphere first became oxygenated. And this event is what precipitated the banded iron formations. Other mechanisms have been proposed from GOE such as hydrothermal venting and bacterial oxidation.